To easy up the handling of the reel, I made a small extension. Of course a rope with knots would do fine, but the ribonrope is less problematic to handle. 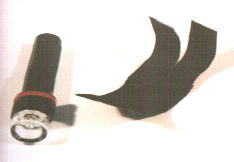 Lay a piece of strap around a D-ring and sew it. The same thing happens to the other end and a carabiner. I like a length of 50cm. Take a plastic buckle and drill 3 holes into the part for the belt. The stainless steel spring are fastened there. 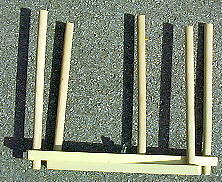 The other end of the springs are fixed at a part as seen in the picture the same way. 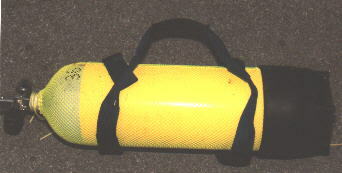 A belt webbing lays around the springs. It creates a maximum extension and a security if something goes wrong with the springs. To protect the suit, put a rubber band around the springs and sew it. 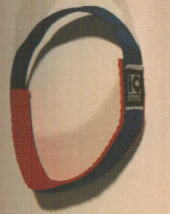 b) rubber band: buckle and second part are connected by a solid webbing. Put 2 to 3 rubber bands around that webbing as elastic element. 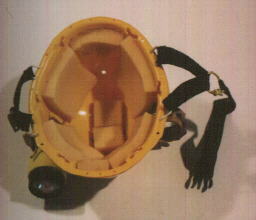 I saw the first protection helmet for divers 1991 when preparing for a wreck dive. It was clear, I need one !!! Helmets for climbing and canoeing would be a good solution but also a rather expensive one (>600ATS). So I bought a cheap one for building workers for about 120ATS. The peak was cut away, because it is useless. The inner frame went the same way. I glued pieces of foam into the helmet for a good fit. Normally there is no chin strap but you can add one as seen on the pictures. The mounting of the lights depends on there shape. 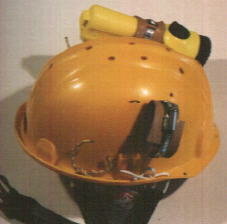 The easiest way is to lead a steel collar through holes in the helmet and around the light. Rubber straps protect the lights against scratches. I added two metal plates with holes, because the soft plastic wouldn't stand for long. The collars would pull through the plastic. Before fixing the hole position you should test the beam direction. The best position is at about 45° when seen from the front, if you don't want to get entangled somewhere. It is important to drill some holes into the top of the helmet, so that the air can flow out. The helmet is especially useful if you use a drysuit with a latex hood ! A method of fixing something at the tank is easy to append. Just take a long stainless steel collar (perhaps two) and mount it around the tank. Lead it through 2 D-rings before that, putting them on opposite sides of the tank. Such a kind of mounting is necessary anyhow for stage and pony-bottles to fix them to the jacket. On this occasion I want to recommend everyone to use a handle at the tank. These gadgets are cheap (100-200ATS) and help a lot. This is an option for carrying a (long) tank more comfortable. Take a belt 40mm wide and about 180cm long and put pieces of bicycle tubing (40cm) onto the endings. Lay small loops around the belt at the endings and sew them. I added another part of belt in the middle to improve comfort. Most novice jackets don't have many possibilities to attach something. If you don't want to switch to a tec-jacket, there are still some options. 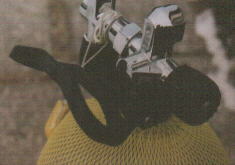 You can get D-rings at some dive-shops and at marine stores. 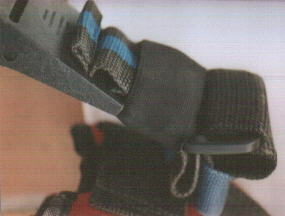 With some belt webbing you can fix them at many places at the jacket. Just be careful not to damage the bladder. Loops inside the pockets are useful to fasten the equipement. 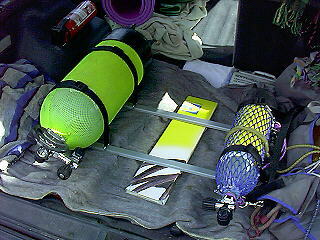 At these URLs divers, mainly cave divers describe how to put together a wing-style jacket on your own. 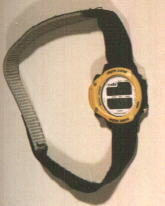 Many watchbands are just too short, if you wear a drysuit with thick underwear. One solution are the bands from IQ-Systems, but I couldn't get one round here when I needed it. So I made one on my own as they are not very complicated. Sew the rough part of the velcro onto a webbing 175mm long and 20mm wide, then at the end a soft velcro about 220mm long. This part threads through the rods of the watch. Let it first be longer. After the first use cut it to the necessary length. To compensate for differences in circumference because of ascending pressure you can add a part (3cm) of rubber band. 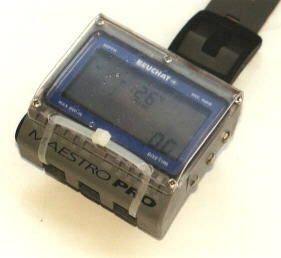 If somebody has problems with the short wrist band of a Beuchat/Cochran divecomputer, there is a solution.Henrik Carlsen made a plan how to construct a band similar to the upper in Adobe PDF-format. Ask him or me if necessary. I also like the Scuba Chrono by SWATCH. But its watchband is much to short. At least for my model there was no loner one, because SWATCH has a special kind of fixing. To use it though I got an original replacement watchband and cut the part with the buckle in a way, that it fits into the existing buckle. So I won some cm. Sometimes it can be useful to mount a small light directly to the mask strap. Some lights have such a possibility, but you can add one to the cheap ones, if they have a longish aperture at the side. Take a broad velcro and sew the two different parts. Cut the hard part for some centimeters and put one half through the aperture at the light. 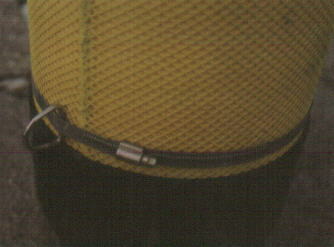 Then lay the light at the mask strap and put the velcro around the strap and the light to fix it. Such a light is not very bright, but it's enough to read a computer. Writing boards can be useful from time to time. Besides you can save some money when doing it on your own and making your own design. This writing board had some lines fixed at it and a pen, when I bought it. Unfortunately these lines were totally unpractical. They got mixed up or got loose (one dive even twice!). So I made a few changes oriented by a commercial model. The lines were removed. Instead I cut a longish hole into the plate and lead a strap through with a Fastex buckle. 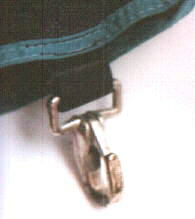 The other part of the buckle is connected to a plastic snap bolt by another strap. So you can take away the board quickly. 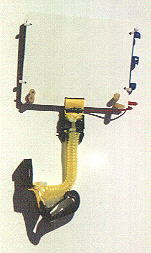 This kind of attachment is available readily in a lot of combinations. 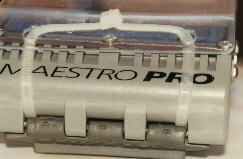 The pen is fixed by a piece of surgical tubing. You drill two holes into the board, just large enough to put the tubing through. The tubing forms a loop which holds the pen. Another fixation of the tubing isn't necessary if the holes are small enough. The snap part is nearly the same here. 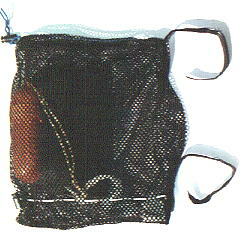 But a piece of rubber line is sewn at the end of the strap. It is then lead through a hole in the ready writing pad. The basic part is a piece of plastic plate. An erasable magnetic writing pad from a toy shop is fixed upon it. (e.g. "Magic Doodle", messages in a newsgroup tell that it withstands the water pressure; commercial models are made from the same parts.) I drilled 4 holes at the outside (don't destroy anything !) of the writing pad and connected both boards with cable ties. The magnetic pen and the pencil are hold together by a piece of surgical tubing. A piece of string secures them. Further short pieces of tubing loops hold the pens. The connection to the bolt snap is the same as with the first model. I added a spiral cord from a children key holder. 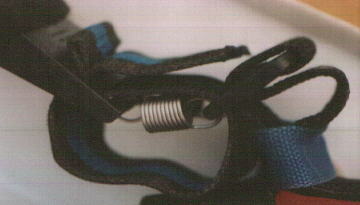 The endings are only lead through the strap loops and fixed with two cable ties. I've seen this version at technical divers. A flexible plastic plate gets 4 holes. 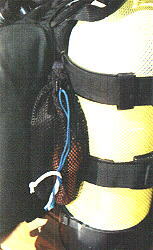 Pieces of tubing are lead through the holes and secured with cable ties. Two short loops hold the pencil. 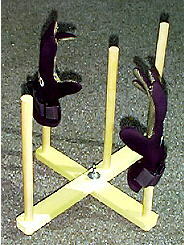 The assembly is slipped over the arm. 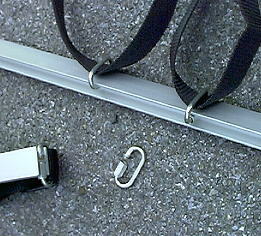 And now something similar - a securing line for accessories e.g. 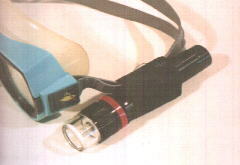 a diving light. It's the same principle as above, only now there is a third loop through which the spiral cord is lead. I made two loops and fixed it with 4 cable ties. Although being only a cheap spiral cord, it holds 6kg without problems. Here is another more rugged version. The rope is spiral cable which normally connects computer keyboards. You can get them cheap at some electronics shops. 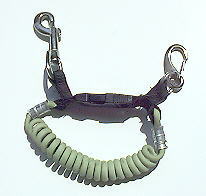 A pressed clamp for steal cable holds the loop. The bag is fixed by velcro. 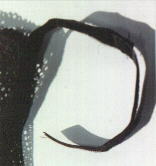 A piece of the soft and hard part of velcro is sewn together and at the upper and lower part of the bag (detail). 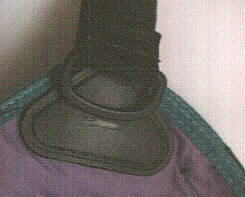 Lay the velcro around the tank straps or the straps which hold the bladder at the backplate. I couldn't get a display protector for my computer (Beuchat Maestro Pro), so I made my own one. I took a piece of transparent plastics (e.g. 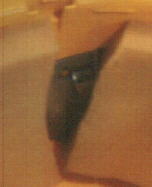 Persplex) and cut it in a way that it is aligned at the sides and gets over at the upper and lower sides. 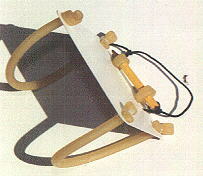 These parts are carefully warmed with a hot air source and bent with the help of a piece of wood. It should fit well over the computer. Make two holes in each bent part. Now lead two cable ties through the fixation of the bracelet. They lay against the underside of the computer. The lock parts go through the holes in the plastic part and will be closed at the upper side. You can get the plastic especially cheap. There are price signs at big markets made from exactly the right material. They have enough damaged ones which are still useful as a resource. With such a rack it is much easier to dry gloves and shoes. I saw such a thing some years ago, but now I built my own one. You can vary the lengths and pole count as you wish. 5 places seemed OK to me. A bolt with wing nut holds the two pieces together. The poles are fixed with wood glue, the two outermost ones got bolts, too. There is a special drilling insert for big holes in wood, that you can adjust from 10-40mm. My rack has no paint on it right now, but it would be better if it gets wet. My tanks used to move in the empty car, so I made this simple fixation. Two alu H-profiles are the basis. 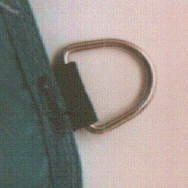 Two chain locks are used for each strap and put at the profile. The strap goes in two layers. I made own straps but the usual ones from the car shop will do fine. Rectangular pieces which get stuck would be better.